Existing cloud providers, operating in isolation, are often prone to Service Level Agreement violations and resources over-provisioning in order to ensure high-quality services to end-users, thus incurring extensive operational cost and labor. As mentioned in Chap. 1, dynamic cloud collaboration (DCC) is an approach to reduce expenses and avoid adverse business impact. It is formed by a set of autonomous cloud providers who cooperate through a mechanism to share resources while enjoying larger scale and reach. This chapter first presents the architecture that establishes the basis to form DCC. 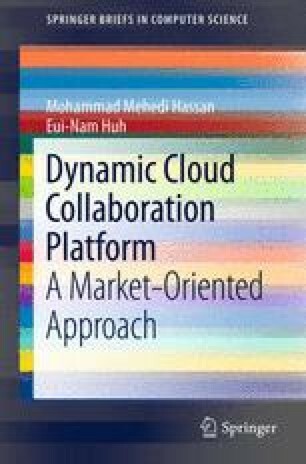 Finally, it describes the proposed combinatorial auction (CA)-based cloud market model called CACM that enables and commercializes a DCC platform.